And that’s exactly where we are with content marketing. In our 2016 Content Marketing Benchmarks, Budgets, and Trends research (conducted in partnership with MarketingProfs), the effectiveness rate for B2B organizations actually went down (from 38 percent in 2015 to 30 percent in 2016). This is not good. And the worst may be yet to come. 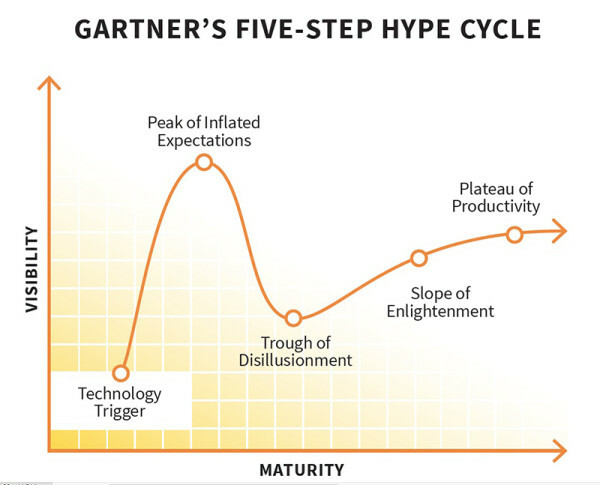 During my opening keynote presentation at Content Marketing World in September, I talked about content marketing through the lens of Gartner’s Hype Cycle for Digital Marketing. The Hype Cycle concept is a great way to follow the adoption curve of a disruptive technology, and it’s amazingly accurate. First you have the technology trigger – in the case of content marketing, the trigger was that all companies, regardless of size, could publish on the web. At the same time consumers had unprecedented access to information. No big media company or corporation controlled the flow of information. BANG. Even though content marketing has been around for hundreds of years, the growing popularity of online content created a free flow of information for both the publisher and the consumer. Then the cycle tilts upward into the peak of inflated expectations. At this stage, content marketing is seen as shiny, amazing, and new. We’ve been in this stage for the past couple years. In some lagging markets, like manufacturing, this is where we are today. After hitting the big peak, we slide into the trough of disillusionment. It’s the moment when all those who tried the shiny new thing realize it’s not so easy. This is where we are heading now as content marketers. Sounds ominous, right? Well, maybe not. Right now you’ll read article after article in other media saying content marketing doesn’t work and we need to consider something else. I see at least one post per week slamming the practice, and even more that say content marketing isn’t really a “thing.” And it makes sense. Lots of companies bought into the hype and started what they thought was content marketing, but either didn’t have a strategy or didn’t execute it well … or both. So they are looking for something else. The reasons why marketers are disillusioned with content marketing are varied: Companies focus on campaigns instead of ongoing programs, publish content that’s brand-focused rather than audience-focused, or produce content that’s undifferentiated in any way. Goals like “engagement” don’t connect to long-term results, and the lack of audience building in any way shocks and astonishes me. Here’s what I believe: Now is when we will witness the greatest content marketing failures of all time. And right now we also will see some of the greatest success stories of our time. What should you do? While your competitors may slow their content-marketing velocity or kill the plan entirely, those that have a strategy and continue to execute against it will win. We know that over time, with a documented plan, a focus on the needs of the audience, consistency, and a strategy that includes audience building, the approach of content marketing works. So, things may get a little weird for a while, but those that keep to the plan will emerge successful. I’m hoping that’s you. 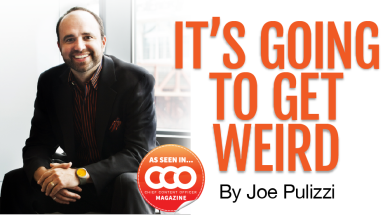 This article originally appeared in the December issue of Chief Content Officer. Sign up to receive your free subscription to our bimonthly, print magazine.